When food equipment service is needed, General Parts Group at 2821 Copter Road, Suite F, Pensacola, delivers the most comprehensive services available. Our industry-certified technicians are experts at everything from the floor to ceiling. Service and repairs are available for refrigeration units, commercial cooking equipment, ware-washing equipment, food preparation equipment, HVACs, and more. Coverage is offered across North West Florida as well as Mobile, Baldwin and Escambia counties in Alabama. 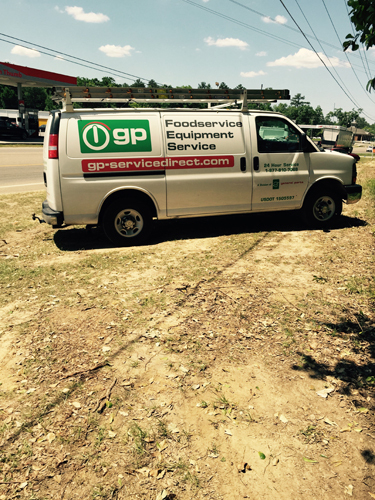 To further discuss our services call us at (850) 435-7530 or email PenDispatch@GP-ServiceDirect.com. We look forward to helping you and your team. Taking Care of All of Your Needs – Whether you need installation, repairs, or service, your one source is General Parts Group. We will take care of everything. Installation – Take advantage of our flexible scheduling options when you need new equipment installed. No matter the brand of your equipment, our technicians can install almost any commercial appliance in your restaurant. Custom service plans – Every piece of equipment is an investment. To ensure it remains dependable for as long as possible, we customize routine maintenance plans for commercial oven repairs and more. Each is designed with both the equipment and your individual needs in mind. This will prevent breakdowns and increase the longevity of your valuable equipment. Repairs – We rigorously and routinely train our technicians to handle every commercial appliance repair you might need in your facility. We pride ourselves in being the one resource you need for all your food equipment service needs, both during and following your equipment’s manufacturer warranty period. Small appliance repairs – If it is a small appliance that is causing trouble, drop it off at our office and our certified-technicians can work on in our on-site repair shop. Manufacturer Warranty Agent – We are proud to support many of America’s most respected foodservice equipment brands as an authorized warranty agent. Review the list on the left of this page for a full list of brands covered from our Pensacola location. Quality Parts – Our O.E.M. Foodservice Equipment parts selection includes most major commercial brands as well as many manufacturer recommended care items. If a part is all you are looking for, shop our online catalog GP-PartsDirect.com, where ground shipping is free when you receive the part at our Pensacola location. Emergencies – We offer service 24 hours a day, 7 days a week, 365 days a year. You will never be without support with our emergency repair department. Schedule on your time – Never worry about a service appointment disrupting your business. You can schedule installations and restaurant equipment repairs at the time that is best for you. If you need updates on our progress, you can request them. Our Automatic Status Update System allows us to send you emails throughout our service. You’ll be aware of what is happening in your facility every step of the way. Online information – We understand that information regarding the services we have provided you are important to managing your operation. That is why you can find open tickets, service history information and more in our online Customer Portal. Click here to request access. Worry-free services – We back all of our services with a 90-day labor warranty. You value your peace of mind, and so do we.